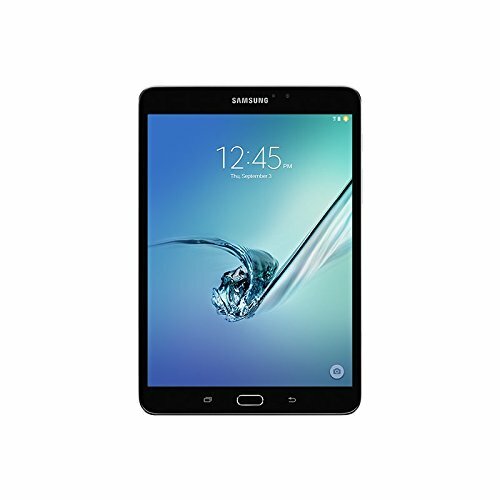 The slim, sleek and lightweight Samsung Galaxy Tab S2 8.0 Tablet was built for life on the move. Just 5.6 mm thick and weighing only 265g, the S2 8.0 lets you take your e-books, photos, videos and work-related files with you wherever you need to go and is comfortable in your hand for prolonged periods. With a 8" high-res touch screen (2048 x 1536 resolution), you can watch video and movies in rich colours and stunning detail, with stereo speakers adding lifelike sound. With 2 quad core processors and 3Gb RAM everything happens stunningly fast, including the latest games and downloads. You can even run multiple apps in split screen mode or in draggable pop-up windows. There's 32Gb of storage built in and it can be expanded by up to 128Gb using the microSD card slot. Enhance your security with the fingerprint lock. The rear-facing 8 megapixel camera and f / 1.9-apperture lens allow you to take bright, crisp pictures and video, even in low-light conditions. There's also a front camera for video chats and selfies. 8" Super AMOLED display (2048x1536). Samsung Exynos 5433 octa core processor. Android 5.0 Lollipop. 3Gb RAM. 32Gb storage expandable by up to 128Gb using a microSD card. 8Mp rear camera. WiFi 802.11 ac. Battery capacity: 4,000mAh. Weight: 265g. Dimensions: 198.6 x 134.8 x 5.6 mm. Samsung Galaxy Tab S2 8.0 Tablet.